Bramble Fountain is a biological generative artwork made out of a collection of 42 Ecological Concept Objects each comprising of at least 21 perennial plants and other important supporting components such as water, sand, rocks, wood, micro-organisms et al. Together these components self-organize into a larger ecological space which can host a multitude of entities, some of which remain in situ, while other more nomadic ones come and go as the terrain and their mobility allows. 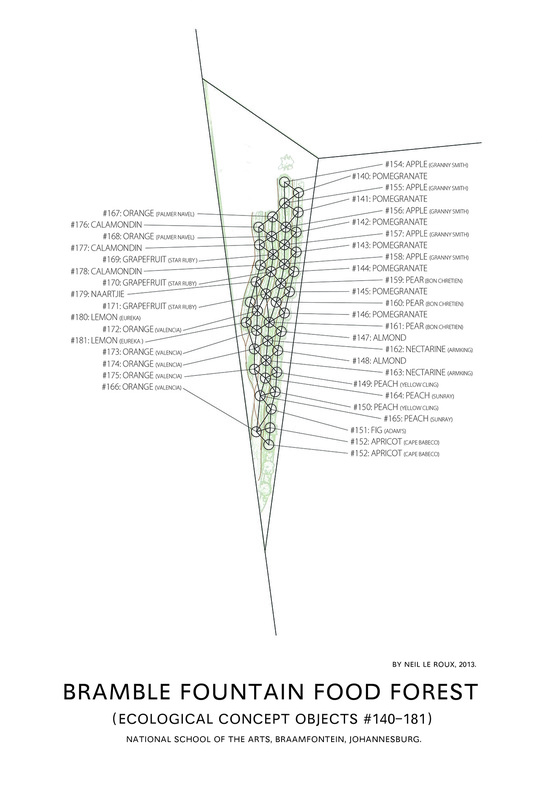 The work actively makes use of a generative strategy in order to manifest a thriving ecological pocket of life. This is achieved by means of establishing a tenable infrastructure that facilitates productive interaction between humans, creatures and objects. This interaction is not restricted to the pure visual contemplation of the assemblage, but encourages a full sensory experience. The Ecological Concept Object (E.C.O.) series of works are different manifestations of the same idea. This idea is basically to manifest and maintain a diverse plurality of beneficial plants in a relatively small space. This plurality consists of edible, medicinal, and ecologically beneficial perennial plants surrounding a central edible fruit bearing tree. When many of these E.C.O.’s are assembled and maintained in close proximity to each other, an agro-ecological landscape or food forest is the inevitable consequence. Agro-ecological spaces are typically those agricultural lands where the farming practices benefit the ecology in the long run, while nevertheless yielding a productive crop. The Ecological Concept Object is a series of conceptual artworks that employ biological entities to form aesthetic assemblages. As the work specifically employs living plants (hosted within a suitable environment), the work takes on the physical form of sculpture or, said differently, a three dimensional ‘object’ form. When I am lucky enough to find a big enough permanent space to host many of these objects, the collection takes on a form more akin to a landscape or large garden. Like all other artworks the figures are framed by a specific ground and all of these are framed by a larger context, like a gallery or museum. 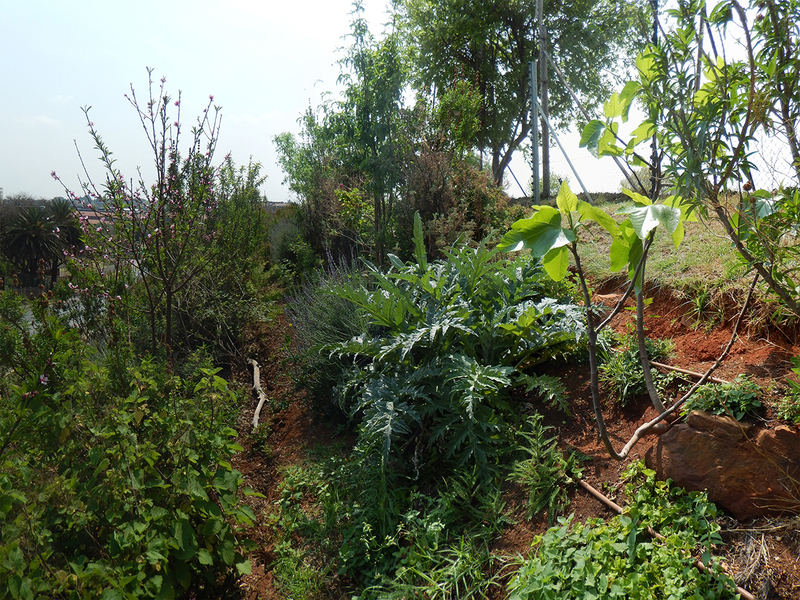 In the case of Bramble Fountain Food Forest the figures are the 22 plants and the ground is literally the soil on the northeastern embankment of the National School of the Arts in Braamfontein. The larger context would be many things including the local weather conditions, the dynamics of the school, traffic flows in and out of Braamfontein, et al. My motivation behind this series of works is underlined by my fascination with the ontological processes of emergence and self-organisation. This work therefore functions much more as a conceptual mechanism for manifesting divergent physical forms, than as a symbolical statement relaying a particular agenda or issue about the Earth or environment. This is not to discount any specific symbolic reading of the work, it is just that my interest does not necessarily lie in communicating any particular message. Meaning making is left entirely to the viewer, visitor, inhabitant or collaborator with this project at large. Of course, these artworks have a special meaning to me, but this has much more to do with its autonomous existence as an aesthetic object, than with any semiotic message it could be construed to signify. Construction started in late July 2013. After some consultation, we quickly realised that the bank would be too steep to make earthworks with heavy machinery a tenable option. Therefore all construction and installation on this landscape has taken place manually with the assistance of hand tools. With the aid of a dumpy level, we mapped out the four parallel level lines on the embankment which would subsequently serve as guides for our terraces. Digging the terraces was critical, not only for its ecological niche-building benefits, but also to serve as footpaths to make the site accessible for further work. Once we had footpaths, bed construction and gardening could commence. The grass was removed from the spaces demarcated for the ECOs and additional plantings. 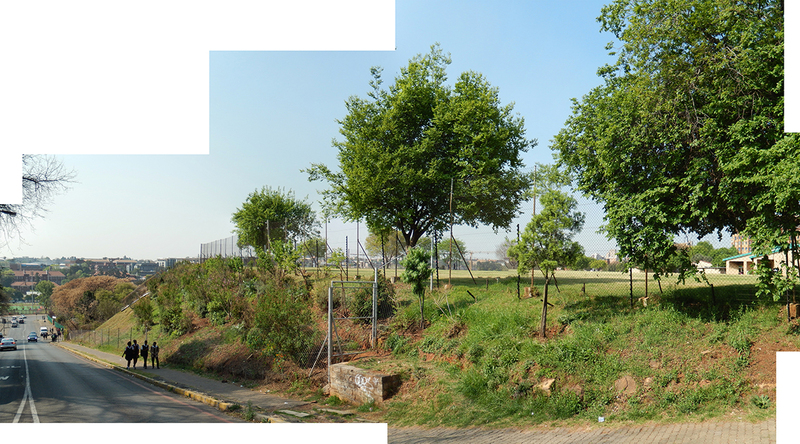 The characteristically red sandy Johannesburg soil was then amended with 15 cubic meters of organic compost. A drip irrigation system was installed to maximise water retention and minimise wastage. Once this was done the planting could commence. The help of volunteers was enlisted to plant over 900 plants in the space of five days. Most of the volunteers were the learners from the National School of the Arts, who stayed on after school to assist in realising this project on time. After the plants had been planted the whole site was covered by a wealth of organic matter to assist in water retention, weed suppression, and providing soil-building micro organisms a habitat to thrive in. Organic fertilisers and soil amendments were also added to the mix of mulch and compost. Big thanks to: Lesley Hudson through the Johannesburg Arts Alive International Festival who immediately saw the promise in the concept in its early generative stage and was determined to enable the vision. Brenda Sakellarides who was possessed by the idea of transforming the North-Eastern Embankment of the NSA into something remarkable.The National School of the Arts, Mr Barnard and the RCL. The School Management headed by the Principal Mr Leon van Gent and the Deputy Principals Sonja Burger and Gary Natali. The School Governing Body and all who agreed to the transformation of the embankment and the birthing of a new greening initiative at the NSA. Jenny Moodley from City Parks for her encouragement and endorsement. Kyla Davis and her Well Worn Theatre Company for being an enthusiastic and committed ambassador for the Bramble Fountain and all that it represents. Silvia Pillon, Ross Douglas, Cobi Labuscagne and the ArtLogic team for their critical role in realizing this project. All the NSA learners who helped with planting the numerous plants and last, but not least, the NSA hostel staff for their kind hospitality. » Neil le Roux`s latest exhibition at Gallery AOP. Panoramic view 2. September 2015. Fig tree and friends. September 2015. Panoramic composite detail. September 2015. 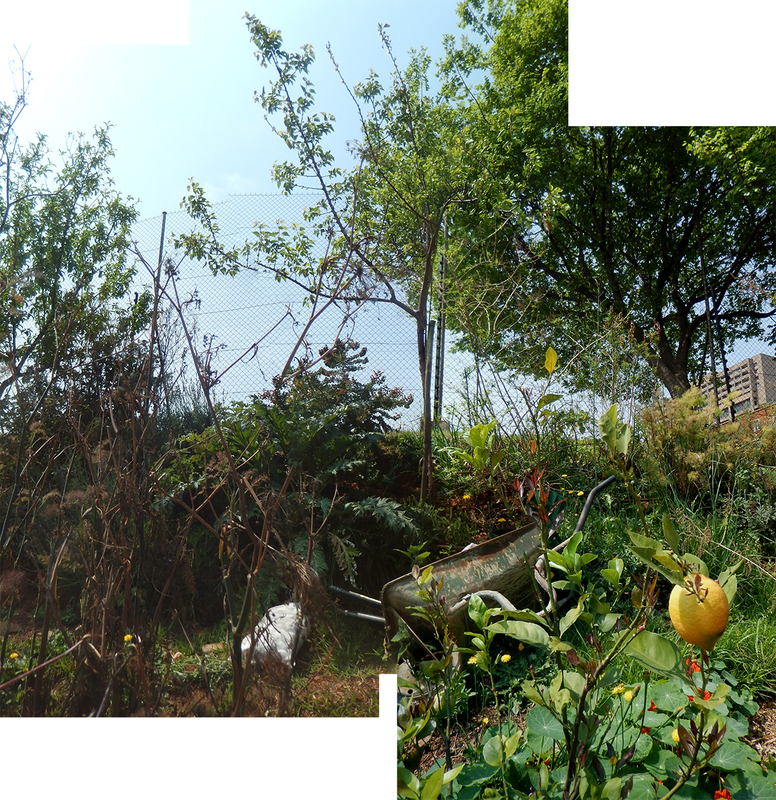 Bramble Fountain Food Forest. September 2015. Bramble Fountain Food Forest map.